The 6ft 8ins Serbia international nodded in a Cameron Jerome cross after Stoke keeper Asmir Begovic had spilled David Bentley's low shot. Jermaine Pennant went close for Stoke from a free-kick, but they were lucky not to concede a second-half penalty. Robert Huth handled a Bentley shot, only for the offence to go unnoticed. Despite the late drama, it was for the most part an afternoon when entertainment was at a premium. Indeed, it was clear from the outset that anyone hoping for a repeat of last weekend's Premier League goal glut would have to look beyond St Andrew's. Statistics and truth can be uneasy bedfellows when it comes to football, but one fact could not be ignored: neither side has a player with more than seven goals to his name. 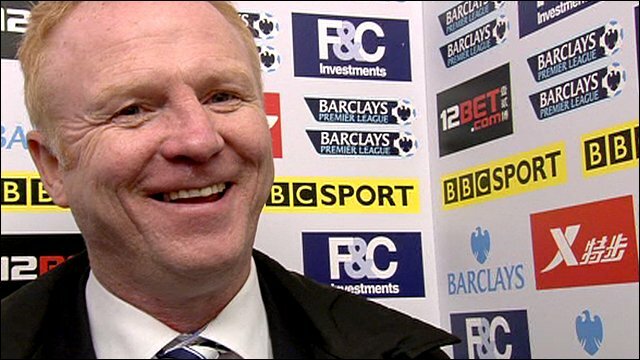 It was never a likely recipe for a feast of entertaining football, and so it proved, but that will not worry Alex McLeish a jot. The Birmingham manager had called on his players to capitalise on the feelgood factor surrounding the club, and the win extended their unbeaten run to five matches in all competitions. The small matter of a Carling Cup final appearance also lies ahead. Like Birmingham, Stoke have not been in the habit of picking up consecutive league wins. They last did so in mid-November, while it was Boxing Day when they last won away from the Potteries. Yet it could have been so different for Tony Pulis's side, who weathered a good start by the hosts to create the lion's share of what few first-half chances came along. The initial signs that Stoke might add to a modest tally of three away wins were not good, mainly because Sebastian Larsson appeared intent on stamping the hosts' authority on the match. With three minutes gone, the Sweden international swung in a cross from deep for Zigic, only for the big Serb to head over under pressure from Huth. He later sent over a free-kick to defender Roger Johnson, whose header was only just held by Begovic. As Larsson was the creative fulcrum for Birmingham, so the bustling Pennant provided the ammunition for the visitors. In Kenwyne Jones and John Carew, the big Norway international on loan from Aston Villa, Pennant enjoyed the benefit of a pair of almost unmissable targets, and the former Liverpool man's cultured delivery from the right flank frequently made life uncomfortable for Ben Foster in the Birmingham goal. But while the two strapping front men battered Foster, they could not better him, and in the absence of tangible reward for his creative efforts, Pennant almost took matters into his own hands, curling a low free-kick inches wide of Foster's left-hand upright. First-half goals have not exactly been Stoke's forte of late, however - they remain the only team in England not to have scored in the opening 15 minutes of a match this season - and when Bentley curled a shot just shy of the post with half-time nearing, there was a suggestion of better things to come from Birmingham. Sure enough, they began the second half exuding the same aura of intent with which they had started the first, and might have opened the scoring through Larsson, who gathered a sweeping crossfield ball from the back, picking his way through the Stoke defence before going close with an angled effort. The visitors were fortunate to survive a credible penalty claim when Huth blocked a Bentley effort with a raised arm. The German turned away, clutching his face, and referee Mark Halsey - who would surely have pointed to the spot had he been able to view a replay - waved play on. A heated post-match inquest looked inevitable, but then came the match-winning contribution of Zigic, whose third league goal in as many games brought him level with Gardner as the club's leading scorer. If he maintains his current strike-rate, the Serb's reputation for inconsistency will be in need of some serious revision. "In the second half I felt we upped the tempo a bit. "They're a difficult side to play against - big, strong - but we could've had a penalty and I felt we merited our winner. 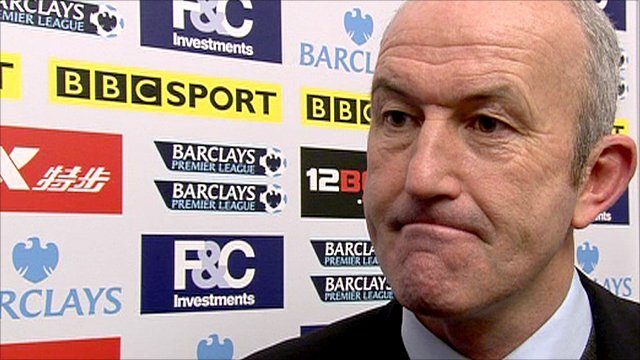 "We almost did a Stoke to Stoke City. "Tony and his side have scored late goals against plenty of sides this season, and for us to get that goal with 30 seconds to go was brilliant." "It's disappointing, because I don't think Birmingham did enough to win. "Asmir Begovic should have cuddled that ball, it shouldn't have come off him as it did, but [overall] I thought we defended very well. "The disappointing thing is that, from a game we thought we'd seen out, we ended up losing." 90:00+5:10 The final whistle goes and the game is over. 90:00+4:46 Free kick awarded for a foul by Nikola Zigic on Marc Wilson. Asmir Begovic takes the direct free kick. 90:00+2:34 David Bentley takes a shot. Save by Asmir Begovic. Assist by Cameron Jerome. 90:00+2:34 GOAL - Nikola Zigic:Birmingham 1 - 0 Stoke Nikola Zigic finds the net with a headed goal from close range. Birmingham 1-0 Stoke. 90:00+1:47 Free kick awarded for a foul by Marc Wilson on Cameron Jerome. Barry Ferguson takes the free kick. 90:00+0:44 Liam Ridgewell sends in a cross, save by Asmir Begovic. 89:49 Nikola Zigic fouled by Ricardo Fuller, the ref awards a free kick. Ben Foster takes the direct free kick. 89:39 Glenn Whelan produces a cross. A cross is delivered by Glenn Whelan, clearance made by Nikola Zigic. 89:17 Glenn Whelan takes a outswinging corner from the right by-line to the near post. 86:46 John Carew is penalised for a handball. Sebastian Larsson crosses the ball in from the free kick. 83:01 The ball is swung over by Stephen Carr, Asmir Begovic makes a save. 81:36 Ricardo Fuller has an effort at goal from long range that misses to the right of the goal. 80:31 Substitution Ricardo Fuller replaces Kenwyne Jones. 80:01 Roger Johnson has an effort at goal from outside the area which misses left. 77:49 Substitution Glenn Whelan comes on in place of Jermaine Pennant. 77:36 Cameron Jerome produces a right-footed shot from just outside the box that goes wide left of the goal. 76:02 Stephen Carr challenges Danny Pugh unfairly and gives away a free kick. Asmir Begovic takes the direct free kick. 74:56 Substitution Cameron Jerome on for Obafemi Martins. 74:30 Free kick awarded for an unfair challenge on Liam Ridgewell by Robert Huth. Ben Foster takes the free kick. 73:16 Martin Jiranek concedes a free kick for a foul on Kenwyne Jones. Direct free kick taken by Jermaine Pennant. Corner taken by Jermaine Pennant played to the near post. 73:16 Booking Martin Jiranek goes into the referee's book for unsporting behaviour. 71:52 David Bentley is penalised for handball and concedes a free kick. Free kick crossed by Marc Wilson, Stephen Carr makes a clearance. 71:15 John Carew takes a shot. Save by Ben Foster. 70:37 John Carew concedes a free kick for a foul on Martin Jiranek. Ben Foster restarts play with the free kick. 69:07 Martin Jiranek gives away a free kick for an unfair challenge on John Carew. Marc Wilson takes the free kick. Shot from just outside the area by Jermaine Pennant goes over the bar. 67:25 Marc Wilson takes a weak shot and went wide right of the goal. 66:08 Shot by David Bentley. Robert Huth gets a block in. Inswinging corner taken right-footed by Sebastian Larsson played to the near post, Kenwyne Jones makes a clearance. 64:03 Effort on goal by Robert Huth from just inside the penalty area goes harmlessly over the target. 62:33 Centre by Jermaine Pennant, Kenwyne Jones produces a right-footed shot from just outside the area that goes harmlessly over the target. 60:10 Effort from the edge of the box by Sebastian Larsson goes wide of the right-hand upright. 59:01 Liam Ridgewell produces a cross. Sebastian Larsson takes a inswinging corner. 58:24 Effort from the edge of the box by John Carew goes wide of the right-hand upright. 57:58 Centre by Sebastian Larsson, save by Asmir Begovic. 57:07 The ball is crossed by John Carew. 55:43 Jermaine Pennant produces a cross, Stephen Carr manages to make a clearance. Corner taken by Jermaine Pennant from the right by-line played to the near post, Stephen Carr manages to make a clearance. 54:06 Shot from outside the area by Sebastian Larsson misses to the left of the goal. 53:14 Obafemi Martins challenges Ryan Shawcross unfairly and gives away a free kick. Asmir Begovic restarts play with the free kick. 49:01 John Carew gives away a free kick for an unfair challenge on Roger Johnson. Direct free kick taken by Barry Ferguson. 48:09 Centre by Sebastian Larsson, clearance made by Dean Whitehead. 47:29 Foul by Kenwyne Jones on Barry Ferguson, free kick awarded. Free kick taken by Barry Ferguson. 46:30 The ball is delivered by Jermaine Pennant, Stephen Carr makes a clearance. 45:27 Free kick awarded for an unfair challenge on Rory Delap by Nikola Zigic. Asmir Begovic restarts play with the free kick. 45:00+1:15 The ref blows to end the first period. 45:00+0:18 John Carew takes a shot. Save made by Ben Foster. 44:12 Liam Ridgewell produces a cross. Outswinging corner taken right-footed by Jermaine Pennant, clearance made by Roger Johnson. 43:42 Martin Jiranek fouled by Kenwyne Jones, the ref awards a free kick. Ben Foster takes the direct free kick. 42:58 The ball is crossed by David Bentley, clearance by Rory Delap. Free kick awarded for a foul by Obafemi Martins on Rory Delap. Asmir Begovic takes the free kick. Correction - 42:22 Robert Huth gives away a free kick for an unfair challenge on Obafemi Martins. Sebastian Larsson takes the free kick. 42:22 Unfair challenge on Obafemi Martins by Robert Huth results in a free kick. Barry Ferguson takes the direct free kick. 41:37 The ball is swung over by David Bentley, clearance made by Robert Huth. 41:21 Foul by Ryan Shawcross on David Bentley, free kick awarded. Direct free kick taken by David Bentley. 40:19 David Bentley has an effort at goal from long range that misses to the right of the goal. 38:21 Rory Delap gives away a free kick for an unfair challenge on Obafemi Martins. Direct free kick taken by Barry Ferguson. 37:40 A cross is delivered by Liam Ridgewell, clearance made by Robert Huth. 36:40 Effort on goal by Kenwyne Jones from 18 yards. Save by Ben Foster. 35:33 Dean Whitehead fouled by Nikola Zigic, the ref awards a free kick. Direct free kick taken by Asmir Begovic. 35:14 Robert Huth has a headed effort from close range and clears the crossbar. 33:38 Jermaine Pennant produces a cross, Liam Ridgewell gets a block in. 32:59 Effort on goal by Rory Delap from long range goes harmlessly over the target. 32:10 Free kick awarded for an unfair challenge on Kenwyne Jones by Barry Ferguson. Direct free kick taken by Dean Whitehead. 31:24 Nikola Zigic fouled by Robert Huth, the ref awards a free kick. Barry Ferguson crosses the ball from the free kick right-footed from right channel. 30:54 Craig Gardner takes a shot. Save by Asmir Begovic. Correction - 28:08 Sebastian Larsson challenges Danny Pugh unfairly and gives away a free kick. Jermaine Pennant has an effort direct from the free kick. 28:08 Sebastian Larsson gives away a free kick for an unfair challenge on Danny Pugh. Direct strike on goal from the free kick comes in from Jermaine Pennant. 28:03 The ball is delivered by Danny Pugh, Stephen Carr manages to make a clearance. Correction - 27:21 Kenwyne Jones takes a shot. Barry Ferguson gets a block in. Corner taken short by Jermaine Pennant. 27:21 Kenwyne Jones takes a shot. Barry Ferguson gets a block in. Jermaine Pennant decides to take the corner short. Correction - 26:11 Craig Gardner gives away a free kick for an unfair challenge on Danny Pugh. Asmir Begovic restarts play with the free kick. 26:11 Craig Gardner challenges Danny Pugh unfairly and gives away a . 25:26 Marc Wilson gives away a free kick for an unfair challenge on Nikola Zigic. Direct free kick taken by David Bentley. 22:52 The ball is delivered by Liam Ridgewell, Robert Huth makes a clearance. 20:48 Handball by Nikola Zigic. Direct free kick taken by Asmir Begovic. 20:00 The ball is sent over by Stephen Carr, save by Asmir Begovic. 18:15 Kenwyne Jones sends in a cross. 17:34 Barry Ferguson delivers the ball. 17:09 Handball decision goes against Dean Whitehead. Sebastian Larsson restarts play with the free kick. 16:35 Jonathan Walters takes a shot. Save by Ben Foster. 15:02 Foul by Danny Pugh on Sebastian Larsson, free kick awarded. The free kick is delivered right-footed by Sebastian Larsson from right channel, clearance by Kenwyne Jones. 12:58 Free kick awarded for a foul by Craig Gardner on Dean Whitehead. Free kick taken by Asmir Begovic. 12:16 The ball is crossed by Danny Pugh, John Carew produces a header from deep inside the six-yard box that clears the bar. 11:51 Danny Pugh fouled by Nikola Zigic, the ref awards a free kick. Jermaine Pennant takes the free kick. 11:41 A cross is delivered by Jermaine Pennant. 9:51 Free kick awarded for an unfair challenge on Jermaine Pennant by David Bentley. Free kick crossed right-footed by Jermaine Pennant, Ben Foster makes a save. 9:07 Jonathan Walters sends in a cross. The ball is sent over by Jermaine Pennant, clearance made by Roger Johnson. 7:19 David Bentley crosses the ball, Robert Huth manages to make a clearance. 5:51 Corner taken by Sebastian Larsson, clearance made by Robert Huth. 5:28 David Bentley crosses the ball, Robert Huth manages to make a clearance. Sebastian Larsson delivers the ball, clearance by Ryan Shawcross. 4:51 Marc Wilson sends in a cross, save by Ben Foster. 3:42 Foul by Rory Delap on Barry Ferguson, free kick awarded. Barry Ferguson restarts play with the free kick. Correction - 2:48 Sebastian Larsson sends in a cross, Nikola Zigic produces a header from inside the area that goes over the bar. 2:48 The ball is delivered by Sebastian Larsson, Header from deep inside the area by Nikola Zigic goes over the bar. 2:11 John Carew crosses the ball, Sebastian Larsson manages to make a clearance. 0:24 John Carew fouled by Roger Johnson, the ref awards a free kick. Asmir Begovic takes the direct free kick.